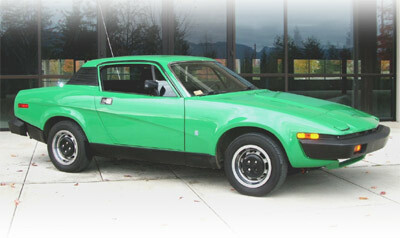 This year, 2005, marks the 30th anniversary of the launch of the Triumph TR7. Designed as the corporate sports car by British Leyland, the TR7 was intended to replace the venerable Triumph TR6 as well as the Triumph GT6, and MG's ageing MGB Roadster and MGB GT coupe. Indeed plans were afoot for the TR7 platform to spawn a new generation of Triumph and BL Group vehicles, a point made in May 1975 by Road & Track "Finally something has emerged from BL's engineering departments, and it's only the first of several new sports cars we'll see over the next three years". Instead a work-shy, malcontent workforce saw that the early TR7's were beset with quality problems, coupled with dithering management and poor judgement on automotive legislation the TR7 ultimately befell a premature demise and the derivatives never saw the light of day. The production run of the TR7 began in earnest in late 1974, dropping from the womb of Speke in FHC form for the North American market and finished seven years later - on Monday 5 October 1981 popping from the loins of Solihull, the vehicle's third mother in its torrid production life. In all we can say that with the industrial action, moving of the tooling and equipment from Speke to Canley to Solihull the car was really built for a little over 6 years. But let us not dwell on the death of the wedge as this is a celebration of its launch. With production beginning in late 1974 the car was first unveiled at Boca Raton - about 16miles (as the crow flies) north of Fort Lauderdale - on January 15th 1975 with showroom sales commencing on 2nd April. Such was the demand from the North American market that the intended Autumn launch for the European model was delayed until May of 1976.
but unfortunately a strike in England (what else is new?) prevented British Leyland starting production on time and the cars shown to the press at Boca Raton, Florida, were pilot models" Did those responsible for the industrial action realise that they really were drawing up their own redundancy papers? Despite the cars being 'pilots' and therfore subject to a more studied assembly the components were not of the highest quality. Which meant that even at the official launch Triumph were displaying - and offering the press test drives in - vehicles which were not of acceptable quality. Despite this Road & Track were rather benevolent and highlighted that a true review of the vehicle's drive and handling would be of little value - due to the differences between the pilots and the full-production vehicle. Reading the early reviews - and I refer only to those of 1975 that focus on the Speke vehicles - one common theme which is clearly evident is that variants of the TR7 were expected. In the Road and Track Technical Analysis article from their April edition (carrying the sub-heading of "
the most important new British sports car in 14 years") they say "
it also seems fairly obvious that the Sprint 16-valve engine will eventually find its way into some version of the TR-7." The Sprint reference also appeared in Autocar for the week ending 25th January 1975, claiming that "The Dolomite Sprint Engine is an obvious card Triumph are keeping up their sleeve." Little did they suspect that with the impending Romany lifestyle of TR7 production that British Leyland would cancel the Sprint and Lynx prototypes - despite development being at an advanced stage. Sports Car World (Sept 1975) stated in their leading sentence "Triumph's new sporty looks like a mid-engined car but in reality it's utterly conventional. Never mind, there's a V8 version just around the corner." Rather than 'just around the corner' the V8 was actually around a long, gentle bend, through the next town and over the brow of that hill in the distance. In the same "The Great Pretender" article they wrote "Later will come a potent fuel-injected version of the 16-valve engine, and probably the Rover 3.5-litre V8." Oh how the people were deceived. It's interesting looking back that it was the Sprint engined variant that seemed to be the model that was most desired. after all he worked (when with Ital) with the BLMC on the Austin Marina and Princess (or as they became the Morris Ital and Ambassador), and surely BLMC wouldn't associate themselves with someone who took the mickey out of the TR7. Oh and I'm a little hazy on the source of the comments regarding the Queen. So if you bump into her you may be best not to quiz her to thoroughly about the TR7 okay? If you must ask any royalty at all you may be better off speaking to Prince Philip - he's (allegedly) a cylinder short of a v8 these days and may tell you about the time he helped Malaysian goat herders get their flocks down a mountain by loaning them his DHC.
" Hmmm. Maybe I should say that Auto-Car (w/e 25 Jan 1975) were referring to the aero-dynamic qualities and the reduced drag co-efficient, and not the actual styling. Later in the year when finally receiving a test car Road and Track (May 1975) didn't comment on the looks other than to say "
from the rear and rear three quarters the high tail and strange, curving crease rising along the flanks make the car look awkward. Overall it's attractive in a crudely rakish sort of way." Is that at thumbs up? Would the following line upset the TR 'purists' (as some enthusiasts saw themselves) "Although it has a fixed roof let it be said from the outset that it is an immeasurably better car than the old TR6". "especially sports cars from BL". Though the author credits the TR7 with being "controllable and fun to drive" he still doesn't rate the road holding alongside that of the mid-engined rivals. but the car was built for the American market and therefore it was this sector that needed to be appeased! The live rear-axle is often compared to the IRS (Independent Rear Suspension) of the TR6 and though all articles agree that an IRS system can be better it is universally acknowledged that a good live set-up is better (and cheaper) than a poor IRS. All of the earlier reviewers praise the characteristics of the handling and mention mild understeer. Road & Track seem to think the cornering ability (generating 0.743 of g-force) is something to shout about "You corner briskly and find the TR-7 has cornering power to spare" they go on "at least the U.S. government hasn't yet regulated handling. Here is where the TR-7 is miles ahead of any Triumph sports car ever built" and on "
gives the driver confidence and this is backed up by a lot of cornering power and good response characteristics" though I am not convinced by "the TR-7 is a distinctly pleasant car to drive fast" which is a bit like saying "it's nice"
sort of wishy washy and "oh it's okay" you could almost say "the car is a bit beige, a bit slipper like, yeah it's alright I suppose". 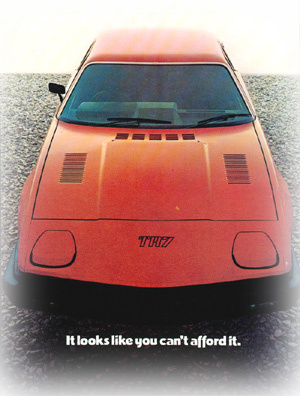 Others are more enthusiastic, and even the R&T reviewer gets a little more worked up later in saying "In general the TR-7s ride is outstanding for a small sports car. ", elsewhere "But if the TR7 rides so softly, it's going to handle like a slush-bucket right?" is asked by Sports Car World, who reply with the simple answer "Wrong!". bringing the TR-7 to a quick stop from high speeds with little work on the part of the driver" Was R&T's comments on the pilot models tested in January 1975 and they again praised the brakes in their May issue: "
short stopping distances and excellent directional control". Sports Car World was less enthusiastic "Brakes are quite good" and were the only magazine to raise the issue of the alarming dive that we experience under hard braking "
certainly it would be better if the nose didn't dip so hard." but when driven hard we found it too easy to beat the 2nd gear synchronizer, and on the occasional down shift to 1st we got a slight crunch even with careful double clutching. A problem we found in the prototype TR-7 we drove earlier, which was supposed to be corrected in the production car persists: a lot of noise from the differential, especially when the driver eases off the throttle at medium or high-speed."
. Though the common theme of the Sprint variants did, almost, subliminally nod toward the consensus that the car didn't go "like a bullet" as the adverts would have you believe. I did rather like the comment "maximum torque occurs at 55mph so there's ample acceleration for passing slowpokes" (Road & Track May 1975). And it is still true today that the 2.0l 105bhp is sprightly enough to get ahead of those who cruise around at just under the UK National Speed Limit (60mph). Those cruising at that speed tend to have just the one constant speed of about 48mph, it doesn't matter whether that's through a village (30mph limit) or past a school (20mph) or on a dual carriageway (70mph), but I digress. however it has surprisingly few rattles - a fact that was picked up by the testers 30 years ago. I wouldn't go quite as far as "You drive off and find out very quickly that the TR-7's unit body is virtually devoid of rattles, wind noise, or road rumble" and I don't think the 175 tyres reduced the road rumble significantly from the 185's that were fitted later. 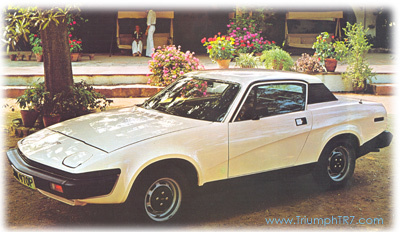 The monocoque shell - the very thing that apparently means the TR7 is not a 'real TR' (I love the blinkered attitude - the same people probably throw a hissy fit if red ignition leads are fitted when that model year had orange ones) - is highlighted as a factor in reducing the shakes from the 7's forebears. 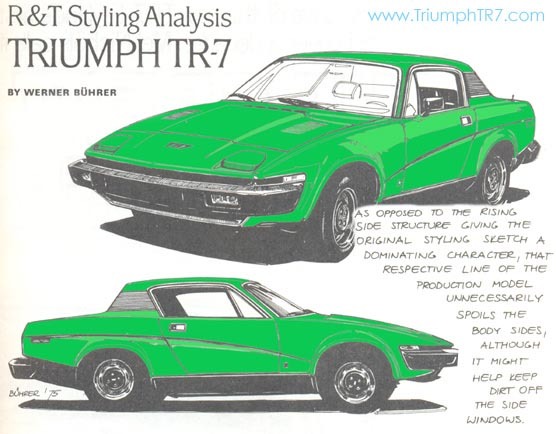 "All Triumph TR's up to now, however, have been characterized by a rather shaky body structure and an unrefined chassis" say Road & Track, pointing out that "Here the TR-7 couldn't be more different". And though Sports Car World agrees that there's a "commendable suppression of noise" they are less than impressed with the cabin space. Likening the TR7, again, to that of a mid-engined vehicle they believed that the cabin should have been more spacious "[the TR7] has all of their [mid-engined vehicles] faults but none of their advantages". 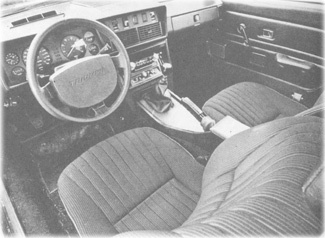 Elsewhere the cabin space was a plus point, but then again elsewhere they were not comparing the TR7 to the mid-engined competition quite so routinely. From a drivers perspective the expansive B-Pillars in particular came in for heavy stick from all quarters, though Road & Track found the forward visibility "a big disappointment" and believed that the short coming in this area would mean "
that [the] large wraparound front impact bumper will probably be put to use in parking more frequently than the BL designers intended". They also found (in May) that "the steering wheel leaves little room for the legs to operate the pedals." it apparently "bothered" him "because you push it down to bring the headlights up". I've never been bothered by it myself I have to say!! well, as 'huge'. Though R&T believed this was to leave "room for airbags, no doubt". Reading the reviews I got the underlying impression of 'cautious optimism'. The reviews were generally favourable, though certainly there was not any fawning and swooning going on. Maybe Road & Track came the closest with "it's almost as if Triumph had designed the car in response to our complaints about the ancient TR-6"; though I should point out that this was "aside from a strange and stubby shape" that I mentioned earlier. They also believed that "British Leyland shouldn't have much trouble selling a lot of TR-7''s at the $5100 asking prices". Sports Car World found the TR7 to be "enjoyable and well sorted" though they pleaded "Give it the 16-valve unit" as it would then "be a flier" with the ability to "blow the six-cylinder TR6 into the weeds". And finally, its prices seems reasonable in today's context. You can't really ask much more than that, except perhaps good looks". So those of us with TR7's have a 'nice' car that was launched at a 'reasonable' price but lacked 'good looks'. Hmmm. Well who cares what they think or thought!!! I'll wrap up but saying that though the list price was $5100 you could bump the cost up with the addition of a stereo radio (AM/FM) cassette for an additional $200 or add air-con for $425. 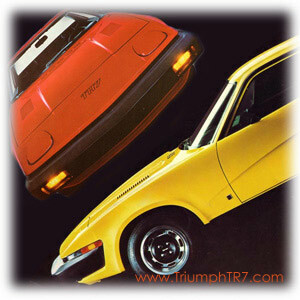 (c) Triumph TR7.com 2004 - many sources have been used in the compilation of this article and credits have been given where due. Please contact us if there's any omission or if we have impinged on existing copywrights.